Today is the 30th anniversary of the 1988 Housing Act that stripped away the rights of renters. Introduced in the final years of Margaret Thatcher’s government, the law removed most limits on rent rises. It reduced minimum tenancies to just six months. Perhaps worst of all, Section 21 of the law made it incredibly easy for landlords to evict renters with just two months notice at the end of their fixed-term contract. It’s no wonder that London’s rents are the highest in Europe if it’s so easy for a landlord to replace their tenant with someone who will be able to pay a higher rent. Thanks to Section 21, many of us live with the constant threat of eviction or feel unable to complain about disrepair. Since 2015, some 140,000 tenants have been victims of revenge eviction – that is, being kicked out after raising a complaint with the landlord. That’ amounts to half of all those who formally complain. The power that Section 21 gives landlords over renters is at the heart of our rigged housing system. One in five homelessness cases are due to Section 21 no-fault evictions. Almost two thirds of all Section 21 evictions happen in London. Receiving a Section 21 notice is one of the most common reasons for London Renters Union members asking for support from the union. Our member Eva wrote beautifully in the Huffington Post earlier this year about the turmoil that Section 21 caused to her and her young son. A few months ago, another one of our members, J, got in touch to ask for support from other union members. Their landlord had served him a Section 21 notice after they’d complained about problems with the plumbing and after issues with their housing benefits. Ealing council had initially promised to help J – but had fallen through. J was worried about where they’d stay or what he’d do with all their belongings if they were evicted. So on the morning of the eviction, over a dozen LRU members and supporters turned up to peacefully stop the bailiff from carrying out the eviction. We blocked the front and rear entrances to the property with our bodies and our banners. When the bailiff arrived, he took one look at how many of us were there and drove off! There’s power in a union. Resisting the eviction together gave J more time to find a new place to stay, as the landlord had to go back to court and get another eviction order. But the next few days and weeks were still incredibly stressful for him. Cash-strapped councils do all they can to avoid providing people with public housing and visits to the council office can take up entire days. Being evicted often means having to move away from your friends and support networks. Finding a new place in the private rented sector can be very difficult, especially if you don’t have the savings for a deposit. 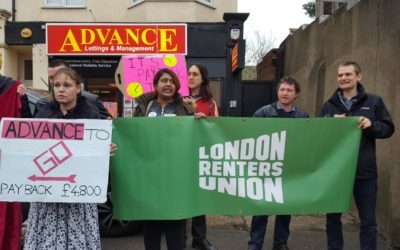 Many estate agents discriminate against people on benefits, and the government’s hostile environment for migrants extends into housing through racist ‘Right to Rent’ legislation. Moving your belongings or finding somewhere to store them can be really expensive. A Section 21 notice might mean the end of a tenancy, but it’s often just the start of an incredibly difficult period in your life and it can really impact on your health and well-being. 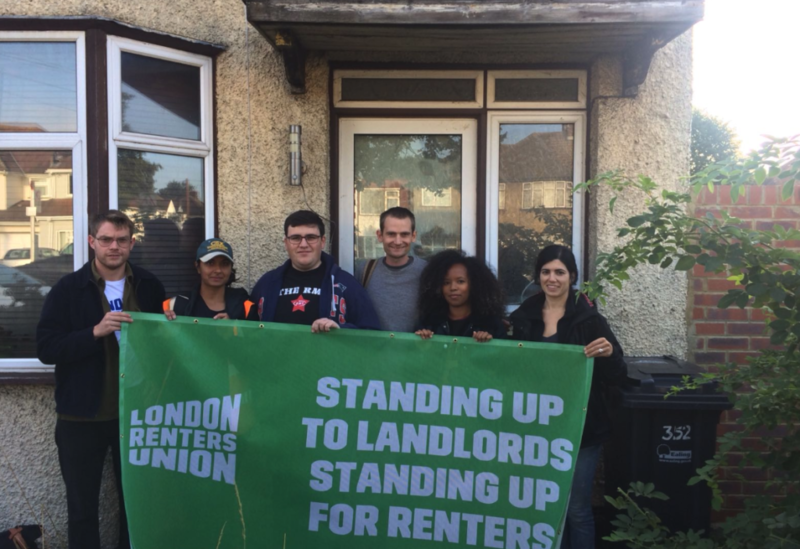 We’re proud to have launched a campaign to repeal Section 21 earlier this year alongside Generation Rent, Acorn and the New Economics Foundation. More than 50,000 people have signed the campaign petition. The leaderships of the Green Party and the Labour pParty have come out in support of the campaign. The London Assembly and Croydon council both support the abolition of Section 21. London Mayor Sadiq Khan says the government should follow the example set in Scotland – where a landlord can’t evict a tenant unless there’s been a breach in contract or there’s a “good reason” such as the landlord selling up. The public overwhelmingly support an end to Section 21. In a recent survey, 59 per cent agreed that tenants who pay their rent and take care of their home should have an automatic right to stay. Earlier this year the government announced modest plans to introduce longer three-year tenancies. While far from a total fix, this would have at least been a step in the right direction. But housing minister James Brokenshire has now scrapped these plans following pressure by the landlord lobby. Perhaps he should be called the Minister for Landlords instead? We’ll keep on campaigning for Section 21 to be abolished. We hope you’ll get involved in the campaign! The 1988 Housing Act helped create a situation where perhaps more than in any other UK country, our housing system is set up for landlords and investors to make money. If someone earns enough money, or already owns a house, they can easily take out a buy-to-let mortgage and rent out a property to cover the mortgage payments. Once the mortgage is paid off, the landlord keeps the property while the renter gets nothing. The housing system plays a big role in making the rich get richer and the poor get poorer. We’re campaigning instead for a housing system where everyone is able to live in a publicly owned home for as long as they like, and where rents are affordable and reinvested in improving housing for everyone. We think this is what most Londoners want too. Maybe that sounds farfetched. But London’s rents are the highest in Europe, while our rights as tenants are among the weakest. Isn’t it more farfetched for landlords and the government to expect us to keep putting up with a system that’s so stacked against renters? What would you like to change about the housing system? Take part in #ReinventYourRent today by tweeting a message on what you think should change about our housing system. Take a picture of yourself holding a sign with your message, or simply write your message in a tweet. Use the hashtag #ReinventYourRent to boost the message that we need to transform our housing system and give all of us secure homes!